If you haven’t had mites yet, be thankful… But know that they don’t discriminate! We’ve had them here and I can promise you, they will leave you feeling like your skin is crawling! Not only that, they are mini warriors and can be a beast to battle! But the battle can be won. With these tips on how to treat your chicken coop for mites, you can get rid of them! Our battle, thankfully, started on a warm day this October. I walked out to the coop to check for eggs and when I pulled my hand out it was literally crawling with them! Seriously?!?! I was out here the day before and there was nothing! In a matter of one day the sneaky little things had exploded into a full blown infestation! And I mean to the point where if I touched the coop at all they were everywhere! I just wanted to strip down there and run for the shower! If I did that though I was leaving my girls to fend for themselves and I wasn’t solving my problem. Now, I am by no means saying that this is going to be an easy fix. It takes a strong will against creepy crawly things and a lot of elbow grease. So, sit tight and I’ll tell you exactly how to treat your chicken coop for mites! The very first thing I had to do to treat the coop was remove ALL of the bedding and the curtains! Yep, every little scrap of it. And because my skin kept crawling I rubber banded my sleeves and pant legs before diving in. Overkill?? Probably. But it made me feel better HAHA! So, all of the beautiful bedding that was destined for my compost pile. What did I do with it? I had a huge bonfire, and it was heartbreaking! But those little pests had to go and I definitely didn’t need the ladies marching back to that compost pile and scratching around in what I just tried to rescue them from! So what now?? Those little jerks are still everywhere! Well, earlier I had said that thankfully the day was warm for October. And that’s because I had to get out the pressure washer (if you don’t have one, it’s OK. We can still get ’em!). If you’ve ever used a pressure washer, you know that when you’re finished it looks like you just rode a boat past Niagara Falls and forgot your poncho. When you pressure wash the coop, you want to get every single nook and cranny, inside and out. Blast the roosts and nesting boxes because those are the worst! Again, if you don’t have a pressure washer use a spray nozzle on your hose that has a power wash setting and be SUPER thorough! An added measure would be to take a kettle of boiling water and poor it deep into the cracks as well. Once you’re finished hosing out the coop spray it down with this spray, or garlic juice. Allow it to dry out while you either check on your bonfire or change into dry clothes! Once the coop has dried out it needs to be coated in diatomaceous earth. You can also rub this into the feathers of all of your birds. Make sure that you use a mask or bandanna to cover your mouth and nose. This stuff is natural and safe but is not good to inhale while it’s floating around. Once you’ve got all of that work done you can finally add bedding back into the coop. The next day you’ll probably notice that most of the mites are gone but there may still be some sticking around. 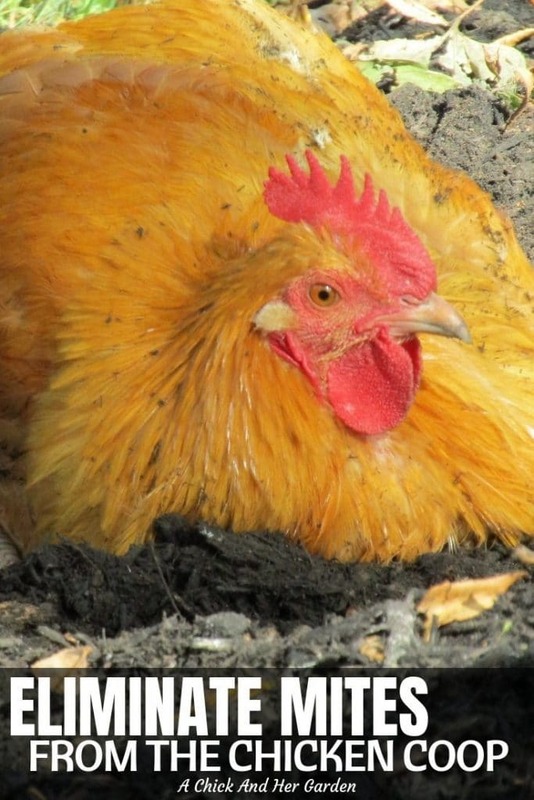 You will want to add more diatomaceous earth to the coop weekly as well as add it to any area that they are dust bathing. You can also add one clove of garlic per gallon of their water as well as apple cider vinegar. These will boost their immune systems and help them, help you defeat the mites. Phew! That was rough! But so worth it for both you and your flock! Don’t fear. Now that you know how to treat your chicken coop for mites, it can be done and with hard work and determination those creepy crawlies will be gone in no time! Have you used anything else to battle mites?? Tell us in the comments! Oh no mites are terrible! Here in Utah it’s really dry so we don’t have much trouble with ticks, fleas or mites but I dust the coop with diatomaceous earth to be sure. Definitely use a dust mask and open all the windows and doors to the coop when using it. Thanks for sharing the tip about the pressure washer to deep clean the coop! When you dust your coops with the Diamtonaceous Earth do you do the entire coop or just around the edges? I am new to all this…!